= Maggie Sensei, itsumo osewa ni natte orimasu. = to take care of someone or something, to look after s.o./s.t. =Someone who love to take care of others or help others. =None of your business! / Mind your business! =Thank you for your support, kindness, work, cooperation (in advance). It’s a phrase which shows your appreciation towards someone’s continuous work or service or their future work or service for you. *なっております=natte orimasu is more polite. It is a formal expression so you don’t usually use this with your family or friends. However, we say this line almost all the time to start a conversation in daily life and daily business situations. We use it for telephone conversations, emails, and letters as well. = Moshimoshi itsumo osewa ni narimasu (or natte orimasu), Maggie desu. = Hello this is Maggie. Thank you for always taking care of me. = Osewa ni natte orimasu. •To call your business or work related people, offices, doctors, schools, you say this with your name. •To email or write to people who you think you owe them work. Note : If you see that person every day, you don’t say this in the office or place you usually meet. =~san (or job title) niwa itsumo osewa ni natteimasu. =~ san is always taking care of me. Thank you! = Musuko ga itsumo osewa ni natteimasu. = My son always troubles you. Thank you for taking care of him. If it was just a one-time thing, you should use the past tense. = Senjitsu wa ( kono aida wa) osewa ni narimashita. =Thank you for your support in advance. It is typical vegetables in Okinawa and we eat them in summer. Since it has been very hot in Japan, we have received lots of them this year. =Here you are! /This is for you! =Ookina oniku no katamari no hou ga ureshiin dakedo. I am working in a kaigo facility and my workmate will be leaving at the end of the month. I want to hand over a gift to her on her last day of her duty and i am wondering what should i say to her. Can i use お世話になりました to her even though she is the one who is leaving? What appropriate phrase whould i tell her instead? Thank you in advance! Is it ok to use 「先月はお世話になって、どうもありがとうございます。」when I want to express my thanks at the end of a training course? How to say : thank you for always taking care of A-san. Should we use sewa o suru or sewa ni naru? Can you give an example for using sewa o suru? So you want to say thank you to someone who has been taking care of A-chan? Then I suppose A-chan is your child, younger brother/sister. Aちゃんが(いつも) お世話になっています。 = A chan ga (itsumo) osewa ninatte imasu. I may ask again in the future. If you don’t mind, I’d like to ask you a question on that matter, though this thread is rather old. What is the difference between “osewa wo suru” and “mendou wo miru”? If I want to tell a girl that I always want to take care of her, which of these two would be appropriate? Or maybe none of these would be appropriate? お世話をする is more polite and 面倒 has a connotation of “trouble”. If you take care of your girlfriend, I would say 大事にする( = daiji ni suru) which sounds much more romantic. Hi Maggie, congratulations on your website! The passion for the Japanese language is very clear in your work! Great job! I hope you can help me with the following request. I am trying to find an expression to thank my son’s teachers for the past (and future) guidance and help in his sport (jiu jitsu). Could I use any of the two expressions? Or do you have a better phrase that expresses gratitude on a more apropriate way? Hi Mary! Thank you for your nice message! Itsumo osewa ni natte imasu. Korekara mo yoroshiku onegai shimasu. How can I reassure my girlfriends mother that i will look after/take care if her when she moves to my country? I also want to tell her not to worry but i dont know if that translates well. Nanimo shinpai shinaide kochira ni kite kudasai. Kochira dewa watashi ni subete makasete kudasai. The potential director already knows your name but you haven’t see that director yet? If so the third one doesn’t work. And the keigo level depend on how high his position is. 〜です。よろしくお願いします。(polite) I think this is sufficient. ~ と申します。よろしくお願い致します。(very polite) If you are not comfortable, use this form. If you were resigning from a position at a place of business, what phrase would be more appropriate in thanking your employer for taking care of you during your time with the company? Either you say thank you or say sorry for all the troubles. = Nagai aida oyasumi wo itadaki arigatou gozaimashita. = Thank you for giving me a long vacation. = Nagai aida, oyasumi wo torasete itadaki, gomeiwaku wo okake itashimashita. = Sorry for all the trouble during my absence. = Kyou kara mata yoroshiku onegai itashimasu. Is お世話になりました appropriate for leaving school for the last time at the end of term? I bet you made many good friends there. Hi, I would like to ask a question. How do we use the phrase お世話になっております when talking to a friend’s boss? For example my friend introduced me to his boss, would it be appropriate to answer, 友人がいつもお世話になっております？ Thanks for your reply in advance! Though we don’t usually say お世話になっています towards our friend’s boss (if you are their family, yes) , I guess you can say that if you always hear their boss really takes care of your friend or they work for a small company. Wonderful lesson for me, an intermediate Japanese speaker. Really great in-depth look at “seiwa”. Oseiwa ni narimashita. Arigatou gozimashita. どういたしまして！I’m very happy to hear that. Could you use to negative of 世話をかける to express that something was no trouble? So something like お世話をかけません？ Thanks! I know every language has it’s own system with tense forms, so I would be really happy if yu could give me a overview for japanese tenseforms with an example?? OK, here are some examples for you. = I am studying Japanese. = I am not studying Japanese. = I studied Japanese yesterday. = I used to study Japanese. = I have studied Japanese. = I am going to study Japanese./ I will study Japanese. Hu thank you very mucht but have these tense forms a special name, future, perfect, past perfect or so.. and how would it be in japanese? I added the information to my previous comment. Please check it again. urm i am not good at examples at all..
maybe you can make some? pleaaaaaase! And could you may make a lesson or give me an example (or both ;)) for if senteces? Like: If you go to Maggie sensei’s page, you’ll find good stuff for learning Japanese! If you don’t go, you’ll miss much! Or like: I could.., if you.. .
How I said not good at examples! I’m just wonderng how to say sentences like this in japanese.. Thanks in advance!! Ex. というのは明日は仕事があるからです。= It’s because I have to work tomorrow. Ex. If you want to see me, come to Japan. Hi! Your site is wonderful! I have a question about おせわになる… I’m writing an open letter/about me to the small town where I will be teaching English for their newspaper and I was wondering if it would be appropriate to close with これからお世話になります or if I should stick to よろしくお願いします. What do you recommend? Hi!!! Thank you for your comment. But I have one question – why do you say “ゴーヤって”, what does it mean? It is a very colloquial speech pattern. When someone tells you something you can’t agree or when something happens you don’t like, you don’t finish a sentence and add って at the end. It gives a feelings of protesting. Ex. そんなこと言ったって… (When someone tells you something hard to accept.) Adding a feeling of protesting. Ex.犬が日本語を教えているって…(What? 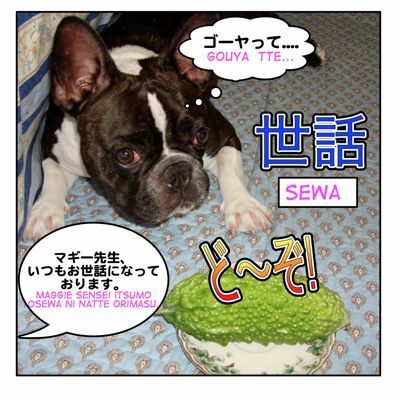 A dog teaching Japanese?? – It’s strange….) Adding surprising feeling.